Artist and sculptor Grace Cathey and I go way back. On the personal side, we met a couple of decades ago and both live in Haywood County. Professionally, Grace installed a showcase of her artworks in the Education Center and the Plants of Promise Garden during the early years of the Arboretum’s exhibit programs. Grace has now touched another Arboretum space with her beautiful talents. 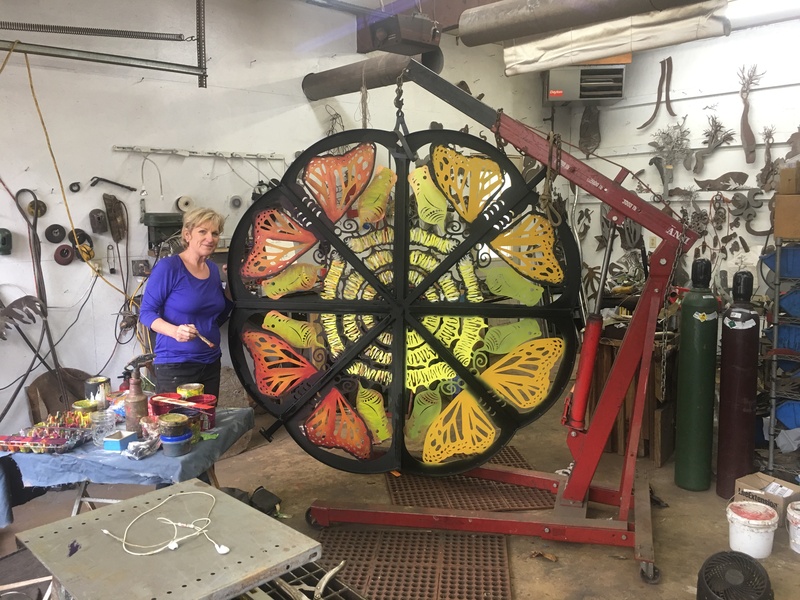 On May 13, the Arboretum’s Forest Meadow welcomed a new metal sculpture by Grace entitled “Life of the Monarch,” which features the different stages of the monarch butterfly life cycle using a colorful, upright kaleidoscope design. The piece was made possible by a generous donation by Carey O’Connor Kolaja and her family, to honor her mother, Louise T. O’Connor. 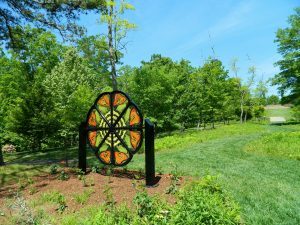 Beyond the sculpture, the Forest Meadow also gained several new plantings and interpretative signage focused on butterflies and other pollinators. This project was made possible in part by a grant from the Blue Ridge National Heritage Area Partnership. When I first strolled through the Forest Meadow after the installation, I couldn’t help but wonder about the details, intricacies and inspiration behind by Grace’s piece. So, I thought I would catch up with Grace and find out a little more about her career and passion for art and nature. 1.) What led you to your career in art? I was born with a passion to create. I recognized this at a young age and went for it. My personality trait that keeps me going is my drive and competitive nature. I keep competing with myself to increase my skills and become a better artist. I also attended the Haywood Community College Professional Crafts Program in 1978. 2.) Have you always focused on the natural world in your works? Yes. I have always focused on the natural world as it really speaks to my creative soul. I love plants and animals. They capture my heart, and I want to try to capture the life force I feel in them. 3.) You and your husband Clayton shared a work place for many years at Walker Service in Waynesville, N.C. How did that working arrangement transpire and what have you done to transition your work since closing the station? As in any situation there have been a few bumps. But overall, it has been a great situation. It has saved me from having to run a gallery every day. Clayton would assist people in the gallery as needed while he was running his side of the business. I only worked on Fridays and Saturdays, which gave me a lot more time in the studio without having the overhead of hiring someone. It’s very hard to do both – create and make all the pieces for your gallery and run the business. 4.) 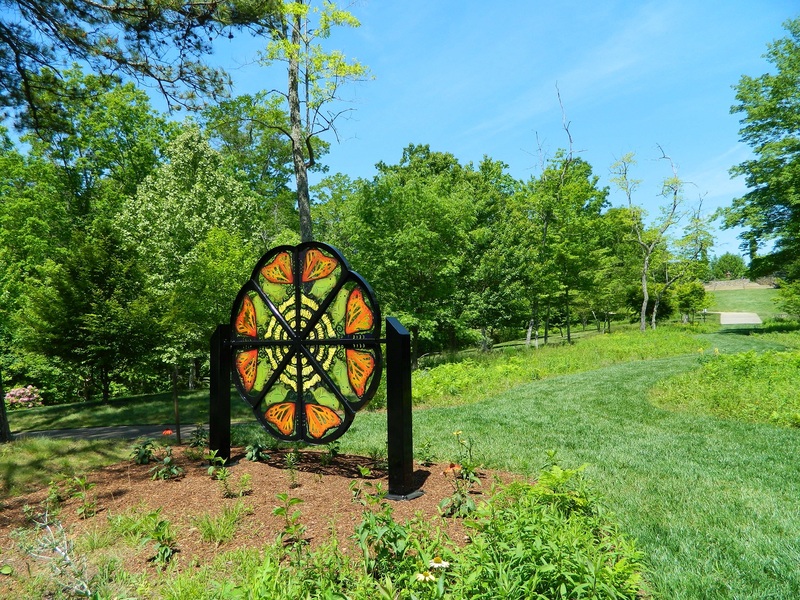 The Arboretum has several pieces of your metal art in its permanent collection. What was your first experience like placing art at the Arboretum? My first piece installed at the Arboretum was a memorial sculpture titled “Spring Peeper,” which is a 24-inch frog that sits on the railing in the viewing area in the Plants of Promise Garden. Of course, being a nature-lover, I adore the Arboretum. I was thrilled to have a piece in their collection. And, I was honored to be selected for the monarch sculpture in Forest Meadow. I believe that makes five pieces that I have in the Arboretum’s permanent collection. 5.) What do you intend or hope for viewers to learn from your artworks? I think sculpture in a garden makes you stop and think how an artist interpreted a plant, and makes you look at plants in a deeper sense than you would have without having a sculpture to accompany it. 6.) What are your upcoming commissions or projects? I love to sculpt, and I love people and working with people’s personal needs for custom pieces. This gives me such pleasure. I have a larger project in the works for an employee who is retiring. I don’t want to say too much about it at this time, as I believe it’s a surprise! Also, I compete in many of the city sculpture competitions in the area and have several private commissions that I am currently working on. For more information on the Arboretum’s 200-piece permanent art collection, please click here.